Trenbolone Enanthate is one of the most well-known, respected, and popular AAS used in BB’ing today. This is not without good reason, as Trenbolone occupies a very unique place in the steroid world. 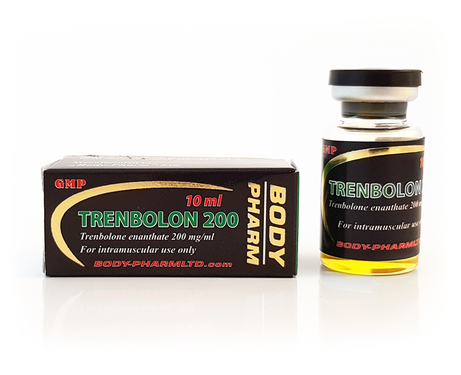 While most potent mass-building AAS tend to result in significant water retention, Trenbolone breaks the mold by providing the user with the best of both worlds; a steroid which not only causes substantial muscle growth, but also increases hardness, density, vascularity, and dryness at the same time. It is well known as one of the best strength enhancers available, with many strength athletes considering it an indispensable part of their program. As a recomping drug, it doesn’t get any better, as Trenbolone proven nutrient repartitioning capabilities have catapulted it to the top of the multi-billion dollar meat industry. In terms of fat loss, again, Trenbolone has no equal, ranking at the very top of the list. As effective as Trenbolone is from a physical standpoint, its effect on the user’s psyche are just as pronounced. One of the main steroids responsible for coining the term “roid rage”, its ability to increase aggression/assertiveness and the alpha-male mind-set are almost unparalleled, being equaled only by Halotestin. This steroid pairs well with nearly all AAS and can be put to good use in both the off-season and pre-contest. One advantage of Trenbolone Enanthate is the typically lower cost per mg compared to the acetate version. While many claim the drug to be unsuitable for beginners, such a broad statement is not always applicable. Still, those individuals contemplating its use should educate themselves beforehand. Tren Enanthate 200 is also a highly androgenic drug, when compared with testosterone, which has an androgenic ratio of 100; trenbolone androgenic ratio is an astonishing 500. Highly androgenic steroids are appreciated for the effects they have on strength as well as changing the estrogen/androgen ratio, thus reducing water and under the skin. As if the report on trenbolone was not good enough, it gets better; Trenbolone is extraordinarily good as a fat loss agent. One reason for this is its powerful effect on nutrient partitioning. It is a little known fact is that androgen receptors are found in fat cells as well as muscle cells, androgens act directly on the A.R in fat cells to affect fat burning. The stronger the androgen binds to the A.R, the higher the lipolysis (fat burning) effect on adipose tissue (fat). Since some steroids even increase the numbers of A.R in muscle and fat this fat loss effect would be amplified with the concurrent use of other compounds, such as testosterone. At very high doses it can have side effects such as oily skin, aggressive behavior, and acne and hair loss. Trenbolone Enanthate strongly impacts on the endogenous testosterone and because of this, use of a stimulating drug like Clomid/Nolvadex and HCG is highly advised while ending a steroid therapy. Otherwise, there might be a hormonal imbalance, for example testes may not be able to respond normally to the resumed output of endogenous gonadotropins due to an atrophied state. Some of the other common side effects of Trenbolone Enanthate are Oily skin, aggressive behavior, hair loss and high water retention. An aggressive behavior is also reported with a higher dosage of Trenbolone Enanthate. Many athletes have reported that acnes tend to appear on their lower arm, upper arm, shoulder, chest, back, and also in their face during early stages of this drug’s consumption. Women should strictly resist it, under every circumstance. No special therapeutic measure apart from termination of therapy with the medicine or dose reduction is necessary after over dosage.